Live updates from the first public debate in the Epsom electorate. Candidates fielded questions on subjects ranging from child trafficking to the plight of Maui's dolphins towards the end of the night. Mr Wood quipped that there were currently more sitting National MPs than there were surviving Maui's dolphins, and he hoped to see that reversed by the end of the year. Chairman Mr Hanson thanked the candidates for attending and the audience for their "respectful participation" in the debate. "In my personal view at least [it was] a wonderful expression of democracy in action," he said. This ends the live updates from the Epsom candidates debate. 8.20pm: National's Mr Goldsmith and Act's Mr Seymour have been asked if enough is being done to tackle inequality. Mr Seymour responded first, saying an increase in competition for lower-skilled jobs and a "welfare state" had failed to prepare New Zealanders for a competitive world. He also used his answer to laud Social Development Minister Paula Bennett, attracting jeers from the crowd. Mr Goldsmith said figures showed there had actually been a decrease in inequality recently, thanks to "an enormous amount of redistribution". 8.07pm: Christine Rankin has been asked what the Conservative's stance on the anti-smacking bill was. Ms Rankin said they would repeal the law, drawing boos, sighs and calls of "shame" from the crowd. 8.04pm: Mr Hanson has now opened the floor for audience questions. The first question was directed at Michael Wood, asking where unemployment sat when Labour was last in Government. He said Labour drove unemployment down to 3.4 per cent, "the lowest in the developed world". 7.58pm: Her speech has attracted a peppering of "here here" from the crowd and polite applause. Ms Haden said she was sued for defamation for more than $50,000 and her marriage suffered during her crusade against corruption. "I don't mean to be a scaremonger, but this is what happened." 7.57pm: Ms Haden is using her time on the stand to lash out at corruption and the lack of transparency in the public sector, using her own previous battles as examples. 7.55pm: The final candidate, Grace Haden (independent) will be next to take the podium. She now works from her Mt Eden home as a licensed private investigator, Hanson said. 7.53pm: Ms Rankin outlined the Conservatives policies, including introducing binding referenda, tougher laws, permanently outlawing legal highs and installing "one law for all New Zealanders, no more race-based policies and no more Maori seats." If elected, Ms Rankin said she would expose "the Rolf Harris of New Zealand" through parliamentary privilege. 7.49pm: The Conservative Party's Christine Rankin was introduced, with Mr Hanson outlining her extensive background in both the public and private sector. She took the podium to warm applause. "When it's come to voting strategically you haven't had choice and that's what I bring to the contest," she said. Ms Rankin said if she won the Epsom seat, she would bring three other MPs into Parliament with her based on current polling. "On their best day Act will bring one....and good on him. I'm not some pawn in a bigger game." 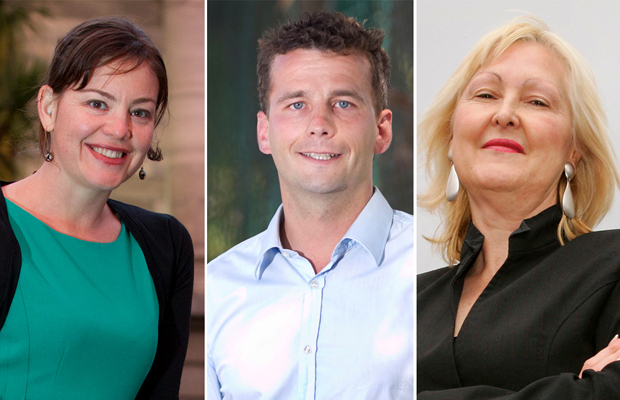 Green candidate Julie Anne Genter, Act candidate David Seymour and Conservative candidate Christine Rankin. 7:46pm: The supply of land in New Zealand needs to be freed up in order for the grandchildren of current Kiwis to have a home, Mr Seymour said. He also took his time to defend the Act/National deal saying: "I didn't vote for MMP, in fact I was in Standard 3 at the time...that's the system we've got." His speech ended with applause from the crowd. 7.45pm: The introduction of ACT's David Seymour has drawn the largest cheers so far. He was introduced as a man who has worked in think tanks in North America and for the New Zealand Government. Mr Seymour had volunteered as a telephone counselor for Kidsline and coached rugby teams at Auckland Grammar, Mr Hanson said. "Hi" "hi" joked the crowd when Mr Seymour took the stand, jibing at his infamous introductory YouTube video. "I'm committted to Epsom and to being your MP," Mr Seymour said. He said he had knocked 11,000 doors during his campaign for the Epsom seat. 7:42pm: "Kim Dotcom has been through the fire," Mr O'Dea said, responding to jeers about Mana siding with the German millionaire. 7.38pm: Mr O'Dea said Epsom voters had "held their noses" and voted for Act for too long. He became impassioned when talking about racism seen in the lead-up to the election so far and appealed for the people of Epsom to "vote with your conscience." 7.35pm: Internet Mana candidate Pat O'Dea is up next. Mr O'Dea is a 55-year-old electrician who lives in Papakura. He is a life-time protestor who's known to his work colleagues as 'Protest Pat'," Mr Hanson said. 7.32pm: Mr Goldsmith has attracted the most heckles so far, from desperate sighs to yells of "what about the price of milk!". 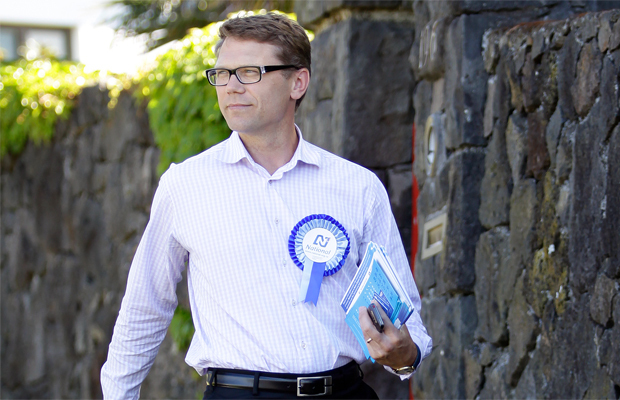 7.26pm: National candidate Paul Goldsmith has been introduced as a man who lived in the electorate with his wife and four children and was a current sitting list MP. "The number one issue I hear from the people of Epsom is that the country is moving in the right direction," Mr Goldsmith said. 7.22pm: Greens candidate Julie Anne Genter is second to speak. Ms Genter said like many Aucklanders, she was not originally from New Zealand "as you can hear from my accent". "I love living in this urban village that we have here in Mt Eden. The Greens were ready to "step up and deliver", Ms Genter said. She was appealing for the party vote from constituents gathered, the same as all Green candidates across the country. Something was seriously wrong with the New Zealand that we love when 60 per cent of the nation's rivers weren't safe to be swum in, she said. Ms Genter took her time on the podium to take a swipe at the Act/National Epsom deal - satirising the "stable, centre-right Government" rhetoric. Greens were focusing on making rivers and beaches safe, not just for wading and boating, she said. She also highlighted other Greens policies, including 20 hours-free ECE and free doctors visits for all children up to the age of 18 and free school lunches. Everyone would receive tax-cuts, due to clamping down on carbon, Ms Genter said. 7.14pm: Mr Hanson said questions from the audience should be framed as questions and not speeches. "Simple and direct is what I ask for." Labour candidate Michael Wood, a 34-year-old father of two who lived in the community "drew the first marble" and was first to speak. "He enjoys cricket, walking and Pink Floyd," Mr Hanson said. Mr Wood started by welcoming his fellow constituents. "Including Paul Goldsmith, who I've only recently met." He said he believed in democracy and fair representation. The people of Epsom didn't deserve to be treated like pawns on a chessboard, Mr Wood said. "At the last election ACT only got 2.5 per cent of the party vote...ACT believes in selling off the superannuation fund. "ACT leader Jamie Whyte has even said that schools should be run more like supermarkets." The politics of race-baiting were not the vales of Epsom or the people of New Zealand, Mr Wood said. "I say, it's your choice." 7.02pm: The ring of a bell, "Kia ora tatou" and the debate has officially started. "Welcome to the Mt Eden village centre and to the third meeting organised by the Mt Eden Village Society," MC Mark Thomas began. Rodney Hanson QC, a Mt Eden resident and former High Court judge will be chairing the meeting. "The rules for this debate are few and simple," he began. The purpose of the meeting was to meet the candidates for Epsom and have questions from members of the audience asked of them. 6.59pm: Mt Eden Village Hall is almost filled to capacity ahead of the first public debate of the Epsom candidates. The Green's Julie Ann Genter, National's Paul Goldsmith, ACT's David Seymour, Labour's Michael Wood, Pat O'Dea from Internet Mana and the Conservative's Christine Rankin have all gathered at the front of the hall, ready for the debate.